WOTBOX is Australia’s premier designer of bespoke containers for bars, cafes, kitchens, and events. Our converted shipping containers create unique customer experiences. Define your brand in a memorable way. Converted shipping containers offer affordability and versatility that can be adapted to a spectrum of environments, customer experiences, budgets and timelines. With the ability to transport easily around the country and up or downscale it with a Tetris-like ability, bespoke containers add creativity and practicality to any event scenario. What unique customer experience are you looking to provide? WOTBOX creates more than standard shipping container kitchens and shipping container bars. Whether you need a custom solution for a festival, outdoor sporting event, retail pop up, or juice bar - tell us your wildest ideas. Our designs can help your business stand out from the crowd. The first question we need to consider when creating bespoke containers is, what's its purpose? How will your space be used? What goes into it? Do you need a rooftop viewing platform and would gold taps provide the right finish? And so on. The space has to serve the requirements of those who will use it, so it needs to work on both aesthetic and functional levels. At WOTBOX we do more than converted shipping containers, we aim to create an experience. So whether you are promoting a brand or product, or creating a dwelling for loved ones, the design must be led by the needs of those who who will use it so their experience is fulfilling on every level. The scale of the project is key. 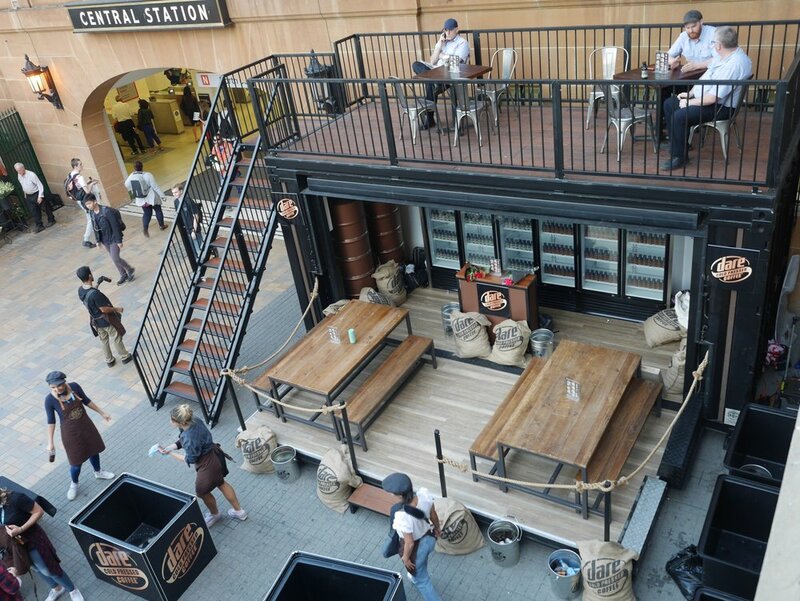 Coffee shops can fit into a 10ft container, but retail spaces and bars are better suited to 20 and 40ft Units. 10ft (3m), 20ft (6m) and 40ft (12m) are the standard sizes for length, with 9ft 6 (2.89m) being the height of a suggested High Cube container, which are best for usable spaces. We are happy to move your container around for you. We know you may want to have your container coffee shop at a festival or your brand promoted at different beaches up and down the country. Let us know when and where you want your custom container - and we will make sure it gets there safely for you. Here are design examples for bespoke containers for bars, cafes, kitchens, and events with added kitchen fitout, tiled walls, stone benchtops, custom cabinetry, themed signage, retractable awnings, and much more. Great Team, with great coordination in all aspects, from verbal communication, paperwork, to build, transparency in documentation, attention to detail in finishes and passion for container fit outs. Great professionalism all round. I engaged Alex and the team at WOTBOX to design and deliver a contemporary Coffee/Cafe from a 20ft Shipping Container. The WOTBOX team ensured the process from planning to operational was quite seamless. They worked within our strict budget constraints and were a pleasure to do business with. If you are looking for a container modifications business then you can be confident dealing with Alex and his team. Amazing result and would happily recommend their services. See how kitchens in converted shipping containers can provide restaurants with access to a new location without high start-up costs. A collection of 10 shipping containers, but inside each of these is a hydroponic, climate-controlled farm growing GMO-free, spray-free, greens–“real food. Wherever beans may be sent after cultivation, they’re almost surely shipped in the nigh-ubiquitous, intermodal, internationally-standardized shipping container.